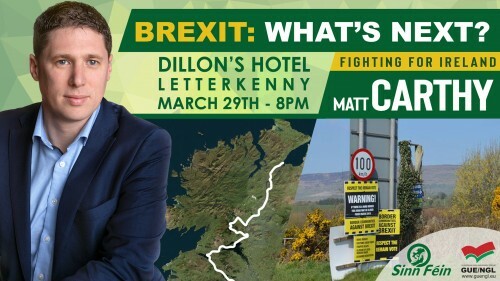 Sinn Fein MEP Matt Carthy will host a special “Brexit Day” event in Donegal on Friday March 29th. The event entitled “Brexit: What’s next?” will take place in Dillon’s Hotel, Letterkenny at 8pm. “March 29th is the original Brexit date. So it makes sense that we would hold a public meeting on that date in one of the regions that has most to lose from a bad Brexit deal.